Hurrah! Victory for Lewisham Hospital! 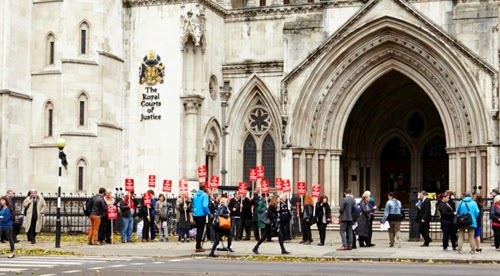 The Court of Appeal has ruled Health Secretary Jeremy Hunt did not have power to implement cuts at Lewisham Hospital. During the summer, a judge ruled Mr Hunt acted outside his powers when he decided the emergency and maternity units should be cut back. The government turned to the Court of Appeal in an attempt to get the decision overruled. 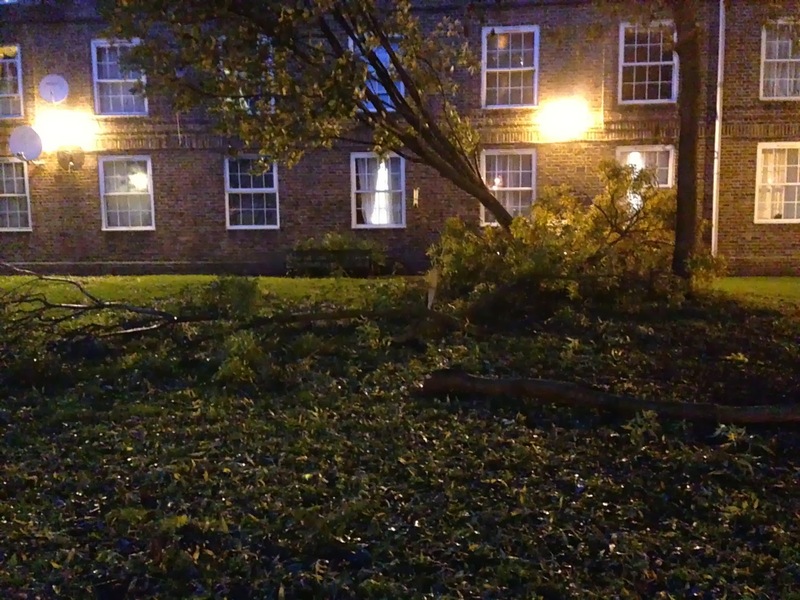 On Crossfields, four trees came down in last night's storm. Two were between Browne and Castell (a bit of a wind tunnel). 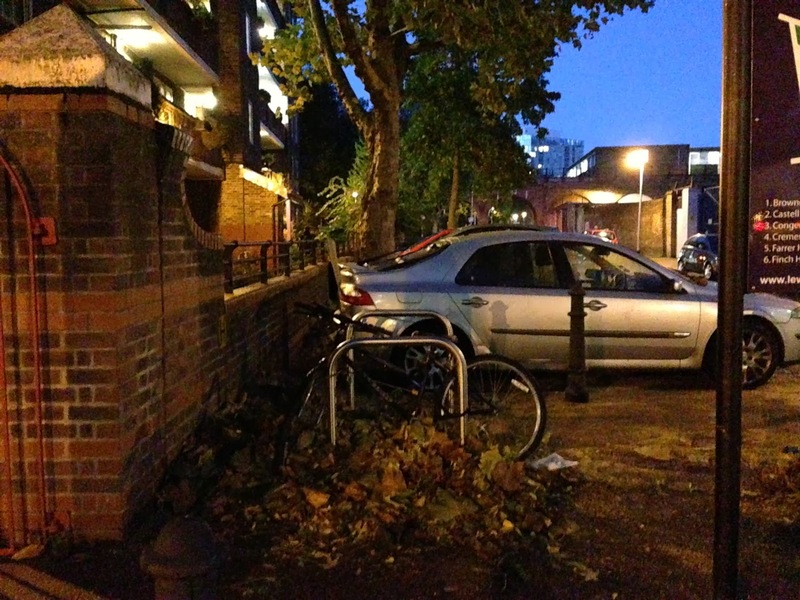 One of these narrowly missed a parked van, whilst the other was caught by a cable. As far as we know the cable did not cause loss of power or phonelines. Another tree came down between Holden and Wilshaw, causing considerable damage to a car. 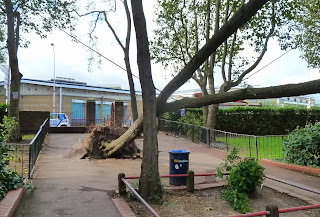 This tree had been fenced off previously, awaiting tarmac repairs that had already taken place around the trees at the Browne/Castell entrance. One more was uprooted on Farrer House lawn, where lots of branches also fell. Another two trees lost branches around the ballcourt. 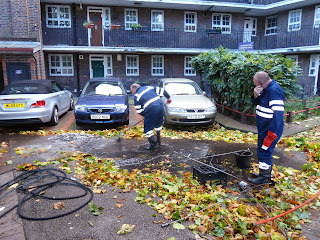 There were blocked drains at Finch, where workmen had to clear a lot of leaves to get to the drain. 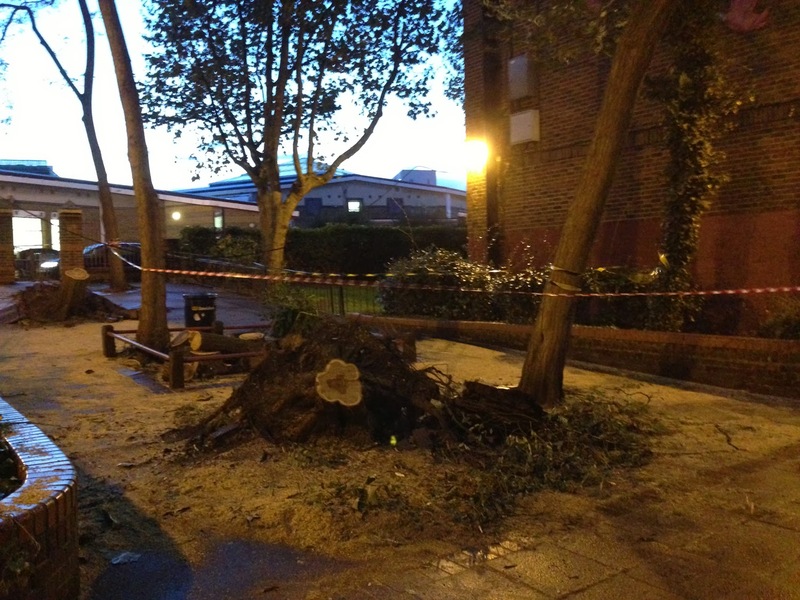 By early this evening, the fallen trees had been cleared, and we noticed more damage at the back of Holden. 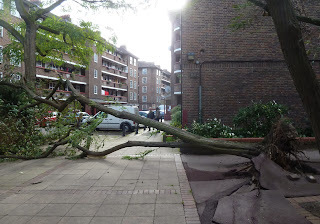 Although the fallen trees next to Browne & Castell have been removed (and chipped this morning), and some debris and leaves have been removed by sweepers (aided by young men who must be on Community Payback), the entrance to the estate at Browne & Castell remains closed. The gate is taped. This is presumably due to the cable which is still hanging low across the path. 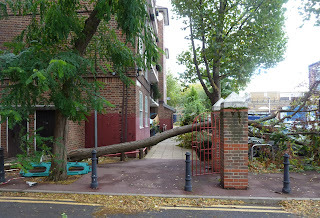 The cable is likely to be the responsibility of a utility company, so we can most probably expect this entrance to remain unuseable for some time. 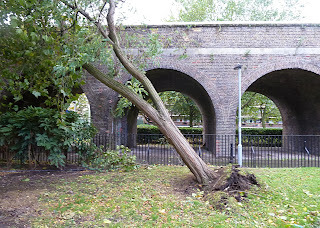 World Monuments Fund puts Deptford Dockyard and Sayes Court Garden on their "Watch List"
The publicity centred around the announcement last week that the World Monuments Fund had included Deptford Dockyard and Sayes Court Garden on their list of places to watch, which also includes Venice and Syria among other places around the world which they consider are under threat. 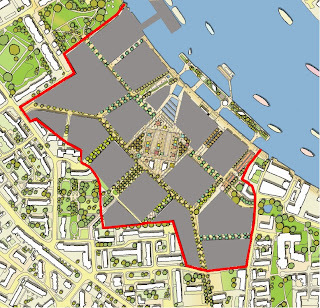 In this case, the threat comes from Chinese developers Hutchison Whampoa, who want to build 3,500 flats on what is now known as Convoys Wharf. 3,000 of those flats will be luxury apartments sold off-plan to overseas investors. 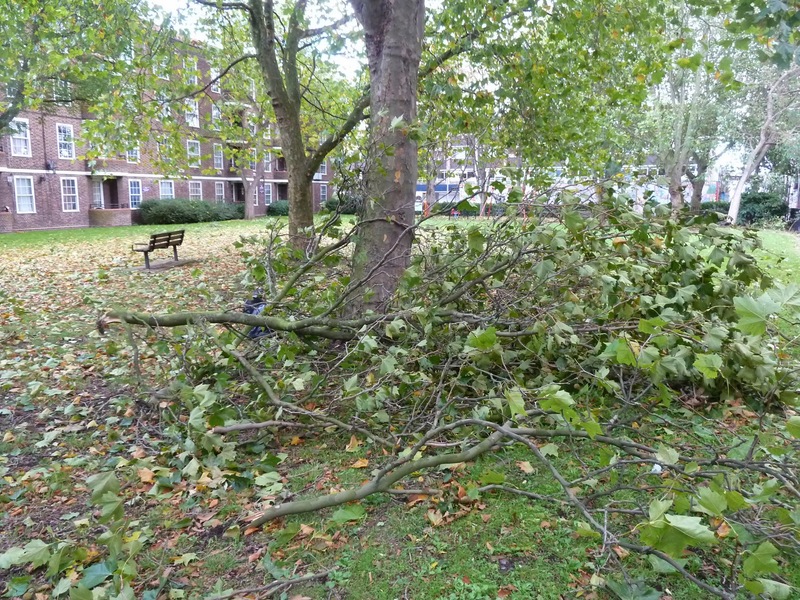 Their latest application is presently with Lewisham Council, to be decided early next year. 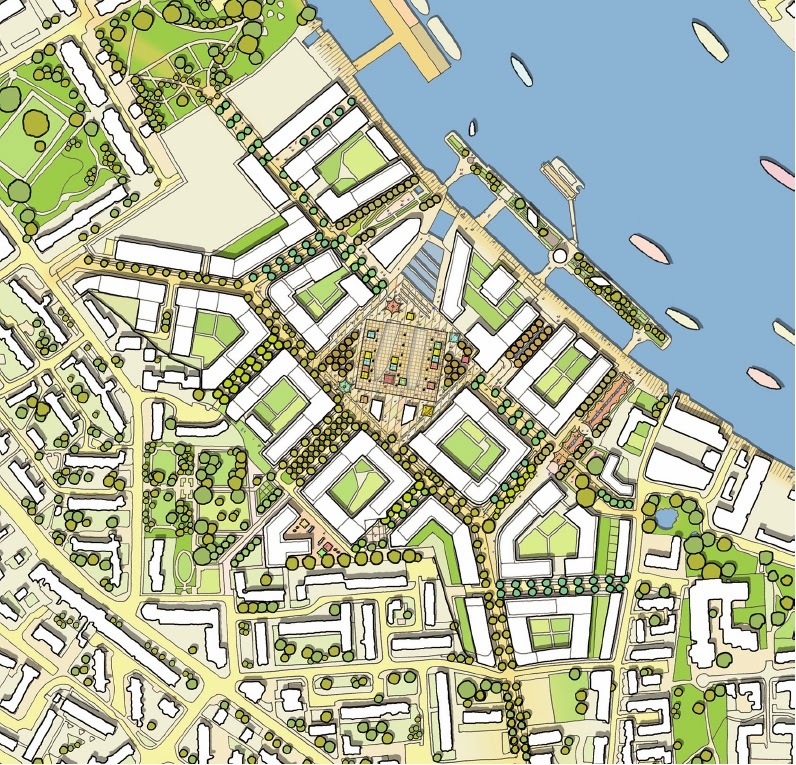 Dr Jonathan Foyle (CEO of WMF-Britain) said: "2013 is Deptford’s 500th anniversary, and today the site awaits residential redevelopment. 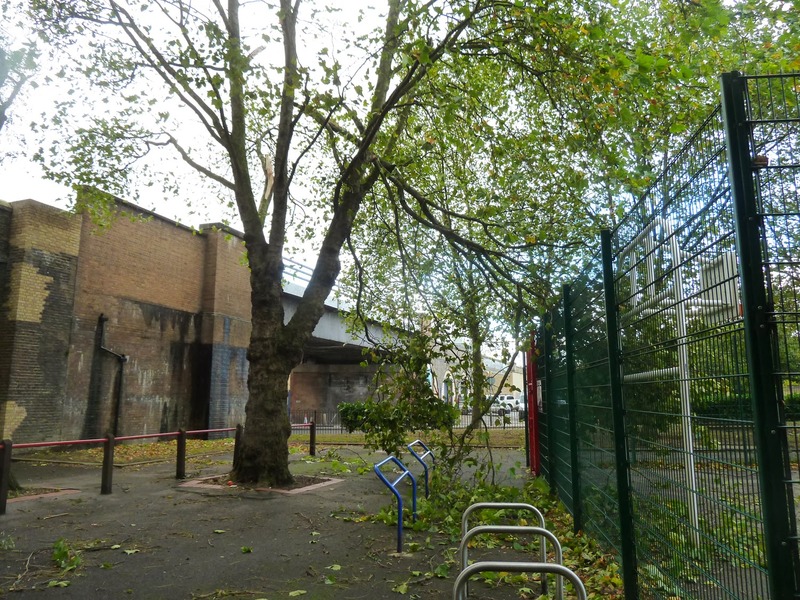 Yet Deptford’s most imminent threat comes from the failure of existing proposals to fully acknowledge and respect the heritage assets that the site has to offer. Incorporating the extensive archaeology and combining this with unique public spaces has the potential to strengthen Deptford’s local identity whilst securing this lost piece of the Thames jigsaw. 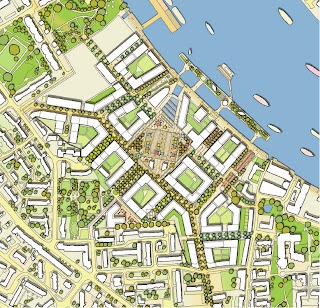 It would also improve awareness of the little-known existence and overlooked history of the dockyard and gardens on a national stage." The campaigners were particularly pleased at how the news team reported the story, but we noticed a a couple of inaccuracies that could have misled the viewer. 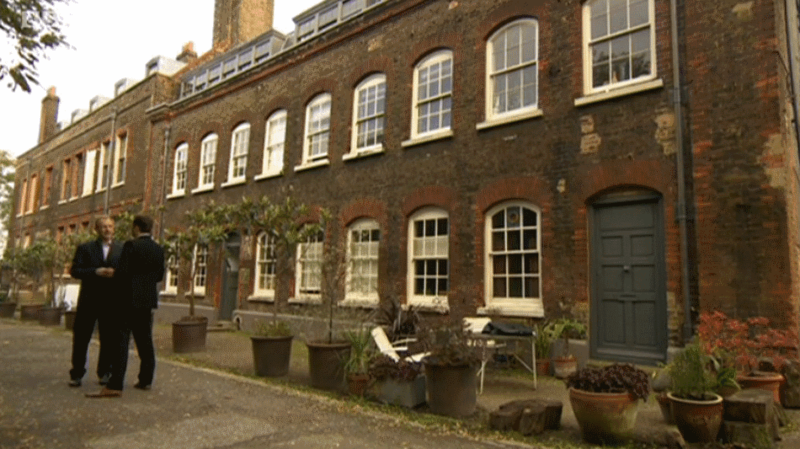 The BBC team said there would be 3,000 "homes", rather than "3,000 luxury homes plus 500 at 80% of market rent". This gave the impression that the problem with London's housing shortage would be helped if building went ahead, which is certainly not the case. Still, at least they got most other details right, unlike some local newspapers, and the Deptford Is... team must be congratulated for their work in raising the profile of the incredible history of the site which led to the World Monuments Fund's listing. We wonder how the Chinese would feel if Barratts went over to China and built a massive private luxury development on the Great Wall of China? Finally, Creekside Village fills one of its retail units...? 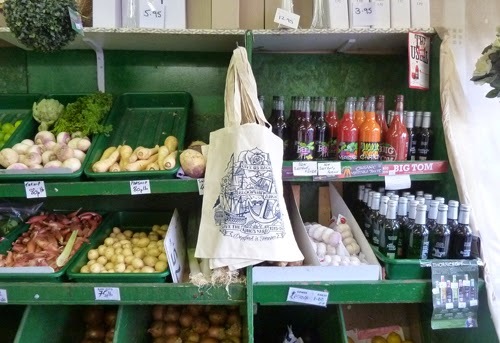 "We are a family-run business (local to Greenwich) planning to set up a deli selling fresh juices, coffee, breads, ham, cheese, pastries, salads and the like to eat in or take away for those evenings where you can’t face the kitchen! "As locals...we want to create a relaxed environment where people can hang-out and enjoy fresh, local produce. We have a license to sell alcohol, so we are currently sourcing some great wines and craft beers, to serve alongside delicious sharing plates, such as charcuterie boards and a selection of antipasti. "We think our business will really support locals in providing a great social space and a place to eat and drink. We like to think of at as restaurant meets home kitchen…a place to indulge in affordable, simple food/drink whilst situated in a relaxed and friendly environment. We want to keep the menu small and flexible to offer customers the best seasonal foods and to minimise “restaurant-style” fuss of huge menus and wasted food. Last chance to see Estuary, an exhibition at the Docklands Museum (or Museum of London, Docklands), just a hop away on the DLR (West India Quay) or an easy walk or cycle ride via the Greenwich foot tunnel. If you love the River Thames, this is for you. It's an art exhibition about the Thames from London to the sea, and there are paintings and photographs, but actually, it's the films that make the entry price (NONE! 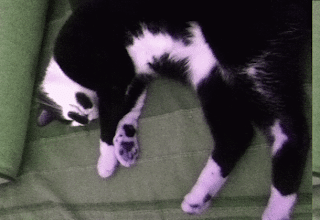 It's FREE!) alone worth going. The most engaging films are on the 3rd floor away from the main exhibition. Called "Portrait of a River" you'll find a series of short films all made by Nikolaj Bendix Skyum Larsen, which bring contemporary life on the Thames into sharp focus, in contrast to a more historical but also engaging film downstairs by William Raban. Larsen's series of films are unpretentious and not at all "arty" and Deptford gets a mention with a little film about the Ahoy Centre's activities, but don't expect much about south of the river. Our time is coming (or at least it's nearer than it ever was). The Museum is also housed in a restored warehouse, and worth the visit alone. Around and about, you'll see construction in the area continues unabated, with more towers going up (and luxury flats sold off-plan before a single piece of concrete has been laid). This show finishes next weekend (27th October), so don't miss! 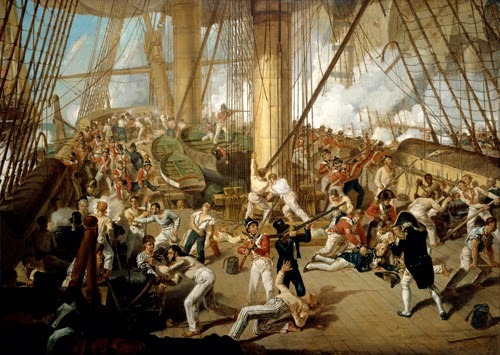 Meanwhile, a new show opens at the National Maritime Museum on Monday: Nelson, Navy, Nation The Story of the Royal Navy and the British People, 1688–1815. It's the 18th Century, and the exhibition explores "how the Royal Navy shaped everyday lives as it became a central part of society and turned sea-faring heroes into national celebrities." It opens on Monday 21st because that's apparently Trafalgar Day. Obviously we'll reserve judgement having not been privileged to preview the show, but on the main webpage for the exhibit, there's a link to "bustling dockyards" and it doesn't go to Deptford, but to a picture of Plymouth. Doh! What is wrong with these people? 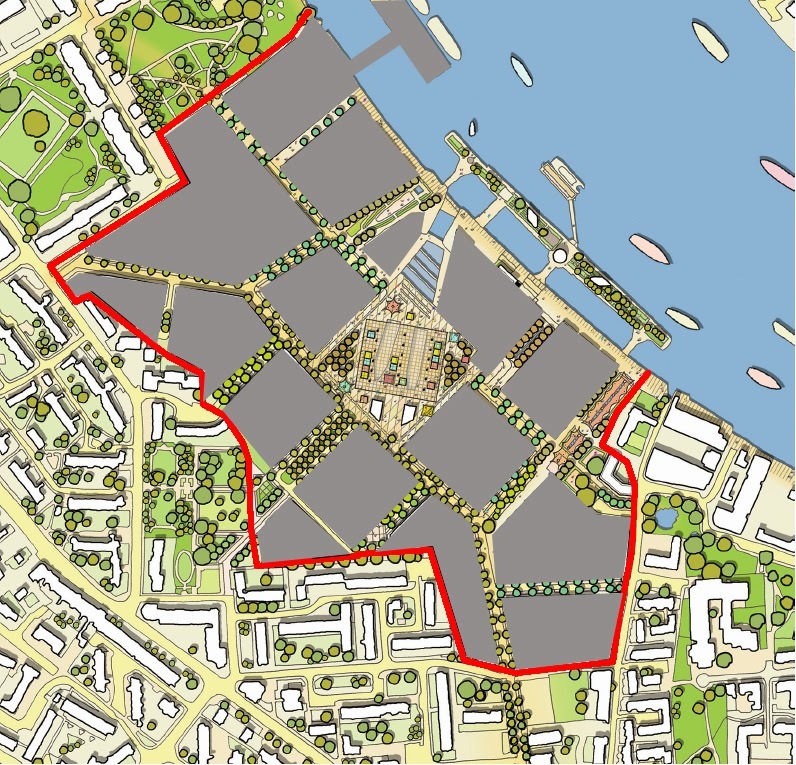 Oh well, Deptford wasn't the only Royal dockyard, of course. It's just simply the most forgotten. What a scoop they missed! Still, if they've managed to conjure up any atmosphere regarding dockyard life, you can apply it to Deptford. To get a flavour of the Nelson, Navy, Nation exhibition check out the video at the BBC News Magazine. The video ends with Cleverley's painting of Deptford Dockyard (the one that is pictured in the mural at the top of Frankham Street) and the words: "in order to understand where we are now and the particularities of our relationship with the maritime world – and with national identity – you cannot ignore what was happening then". First up, it's the FEMALE UKULELE CLUB (or FUC for short!). Meeting next Tuesday 5-7pm in The Bird's Nest for some informal uke practice. No experience required – except you'll need to be female and own a ukulele! 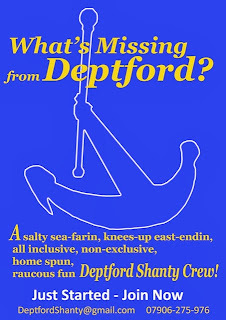 Meanwhile, a DEPTFORD SHANTY CREW has just been formed, aiming to be "salty sea-farin', knees-up East Endin', all inclusive, non-exclusive, homespun, raucous fun". 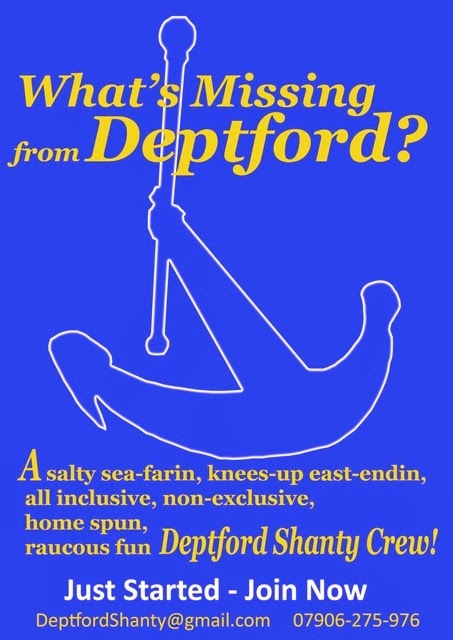 If you're into singing, especially folk tunes about Deptford, get in touch with the Crew via DeptfordShanty@gmail.com. 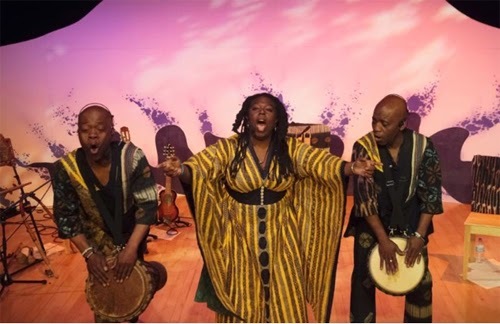 Black History Month is already upon us, with lots of events across the country and of course in London. Go to the Black History Month website to find out more. 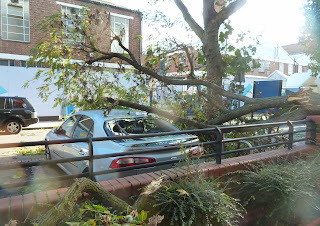 In particular, go to their Lewisham events page to find out what's happening in our area. Many of the Lewisham events are at The Albany or Deptford Lounge. We're already too late to mention Soweto Kinch who kicked off BHM at the Albany with his music and dance piece over the first five nights of October. Check out the video trailer and further details on the Albany's website. If I were here I would face so much. So much would be different from before. That is what I thought. So much that I feared I would confront. That is what I believed. So much would challenge me. That is what I hoped. And in my hopeful state I saw me rising above all the challenges that came my way. I would hurdle the challenges. A champion hurdler – that would be myself. 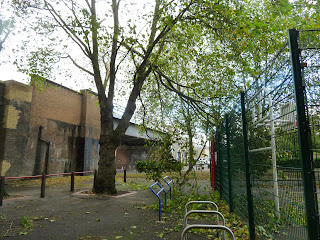 In Deptford. Because to my parents Deptford was hostile territory. 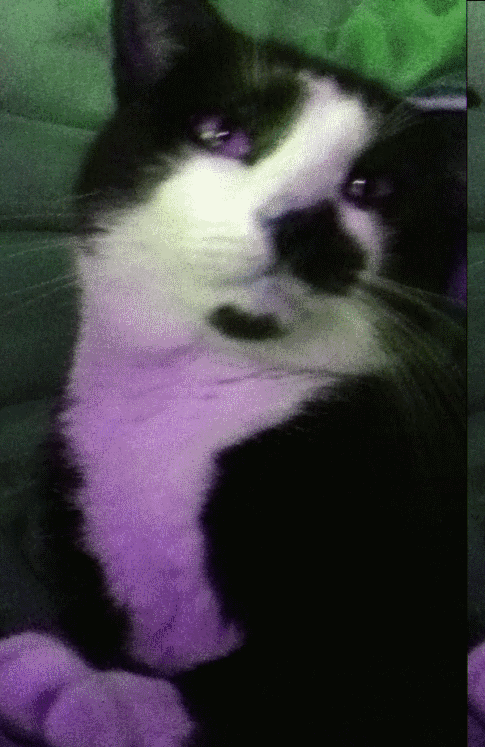 Slumming – my Mother said. Slumming – my Father said. They both talked to me about the slums of Deptford. National Front and heroin addicts – they both said that. They talked to me separately. They used the same words – almost the same words. They had a script – or, that is how it seemed. A Lost Cat and a Council Tax Consultation. 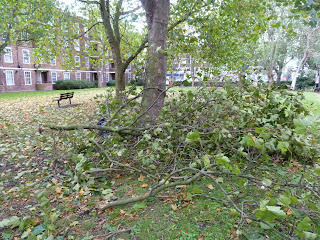 Crosswhatfields has just received details about a consultation Lewisham is conducting about the Council Tax reduction. There's room on the form for comment, whether you see the world in terms of workers and shirkers or think that it may be deeply perverse to get the poorest sections of society to pay for the mistakes of all those clever bankers. The Council is now consulting on its Council Tax Reduction Scheme for 2014/15, and also the additional support available to help certain vulnerable people to pay for their Council Tax. In April 2013 the Government abolished the Council Tax Benefit scheme which helped those people with no or low income to pay their Council Tax. 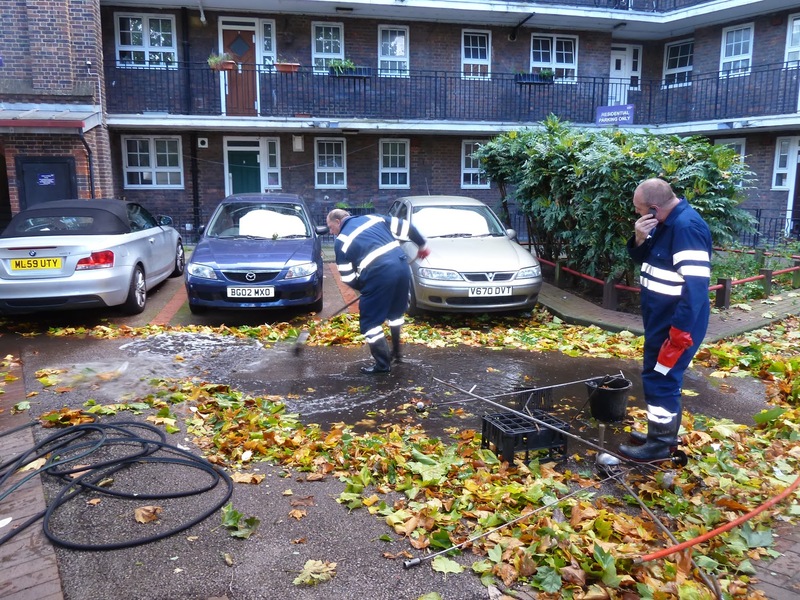 In its place the Council introduced its own local Council Tax Reduction Scheme. The Government reduced the funding Lewisham Council gets for Council Tax Reduction by £3.2m and the Council had to make some difficult decisions about how to continue to support those people most in need. The effect of passing on the cut during the current 2013/14 financial year has meant all working age residents having to pay an average of £2.71 extra Council Tax each week. 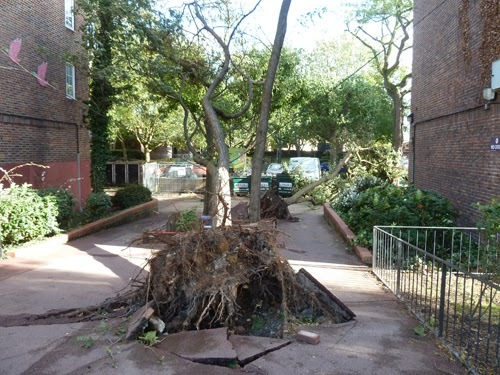 If the scheme remains unchanged in 2014/15 as the Council proposes, it is likely that this amount will not change. Before details of next year's scheme can be confirmed, the Council is consulting on its proposal to continue to pass on the government cut in grant to those of working age and continue to protect pensioners. The Council welcomes the views of Lewisham residents and is conducting a short online survey at www.lewisham.gov.uk/counciltax. Consultation opened on 3 October and closes at midnight on Sunday 3 November 2013. A paper copy of the survey is available by contacting Housing Benefit on 020 8690 8444. 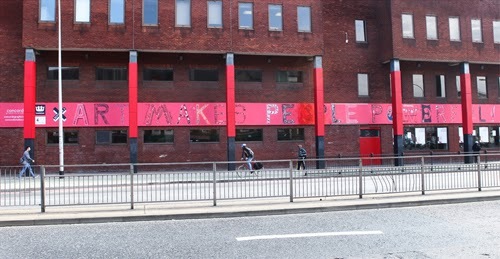 The Deptford X banner "Art Makes People Powerful", created by a flash mob of artists in Giffin Square last Saturday (see video) now hangs on the front of the LESOCO building on Deptford Broadway. 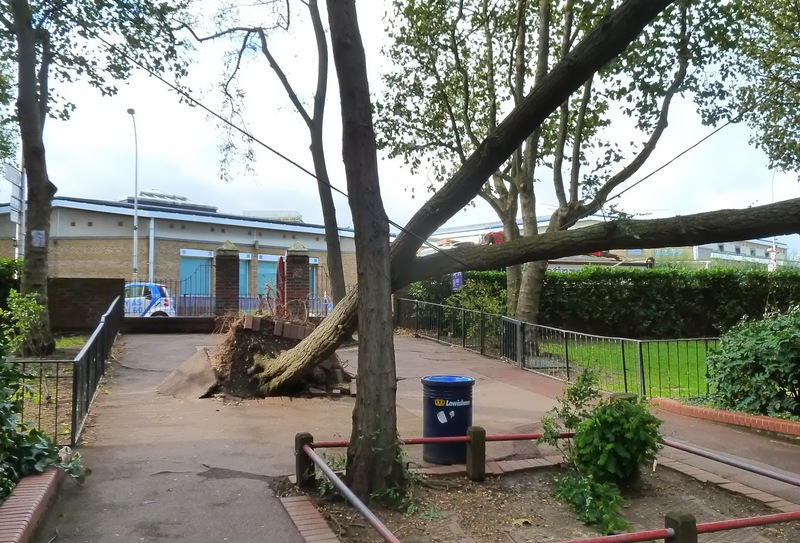 We wonder if Art Can help Make Powerful all the highly qualified staff who have been made redundant (at Southwark, at least, without any renumeration packages) as a result of the merger of Lewisham and Southwark colleges and education cuts in general. Meanwhile, this weekend there are Open Studios and an Art Quiz at the Dog and Bell on Sunday as well as a multitude of gallery shows and shop takeovers. We like the installation at the new Vinyl cafe in Tanners Hill – called Soft Wax, it looks at music and culture of the Jamaican diaspora at the end of the 1950s. The new cafe is lovely, and there's a secondhand vinyl shop in the basement, along with the exhibition. On Saturday at the Albany (10am-4pm), artist Bernadette Russell asks "Is it possible to change the world just by being kind?" in her interactive show 366 Days of Kindness. The idea is that members of the public can write a few words about how a kind act from a stranger touched their lives, on a ticket which is attached to a balloon. The balloons are then released at the end of the day. 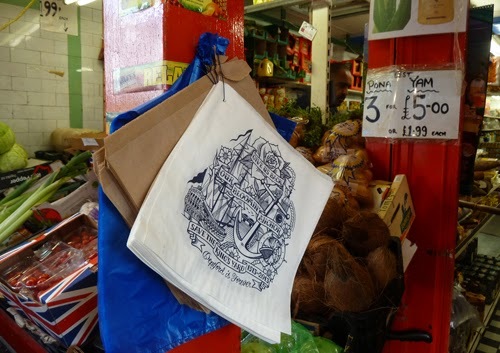 There is still much for us to see, and too much to cover in detail, but we especially like Deptford Is Forever, who have given out paper bags to high street shopkeepers and market traders with a tattoo design printed on them that says "Give Us Back Our Bloomin' Anchor". The design is lovely, and to pay for the free bags the group has also had printed some T-shirts and cotton shoppers that locals seem to be snapping up. 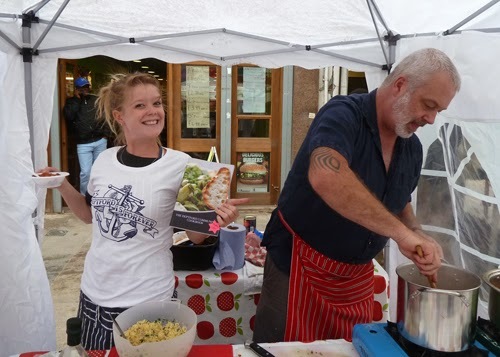 The T-shirt has the Deptford Is Forever logo on it (see below, the shirt being worn by Niaomh from the Deptford Community Cookbook team). You can pick up your T-shirt for £10 at Kids Love Ink, the tattoo parlour at 138 Deptford High Street. 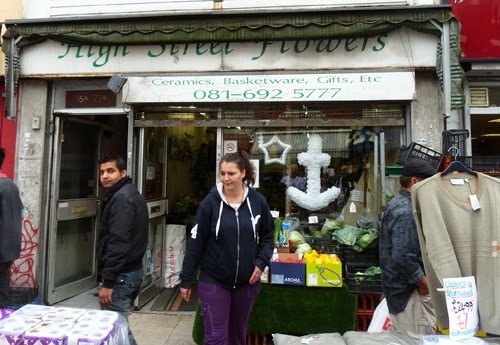 The Waiting Room Coffee shop, Little Nan's bar on Deptford Broadway, and Ralph at High Street Flowers also have some cotton shoppers for sale apparently (£5), and the group commissioned High Street Flowers to make a "ghost anchor" to hang in the window. Not only that but the group have organised a day of FREE tattooing (a little anchor of your choice) at Kids Love Ink. That's tomorrow and is apparently oversubscribed – those wanting to take up the offer had to book today, or else take a chance tomorrow. 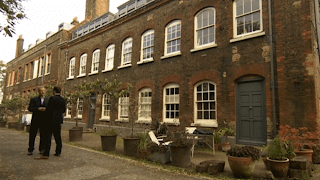 Participants will be asked for a donation to Deptford Reach, the project that looks after Deptford's street drinkers and anyone who's hit hard times, and Build The Lenox, the local project that wants to build a replica 17th century ship at Convoys Wharf. The Deptford Is Forever "Anchor Fest" continues on the weekend with a musical procession along the high street at around midday-2pm which features a huge cardboard anchor made by Arthouse artist Laura X Carlé that was last spotted in the My Deptford show at the South Bank and seen by anyone attending London Open House at the Master Shipwright's House. The procession gathers at the Dog & Bell pub at 12 and aims to end up before 3pm at Lewisham Arthouse on Lewisham Way, where there's an exhibition and Open Studios all weekend. 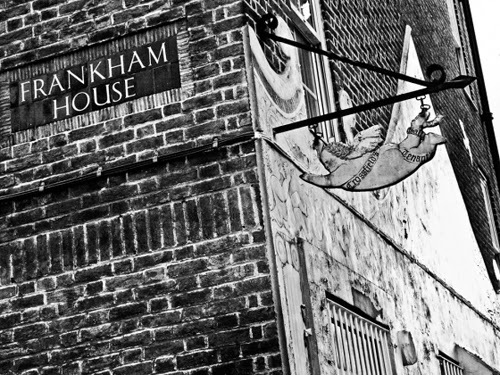 We also hear that Little Nan's will be having a bit of a "Deptford Is Forever" night on Saturday, with nautically themed cocktails, some of which will feature Pusser's rum, the preferred drink of the Navy which used to be stored in Deptford Dockyard. 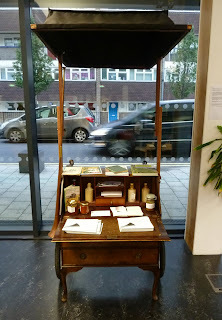 The Bureau of Urban Wilds is an art project by Rebecca Beinart that was launched by Up Projects in July as part of their Secret Garden Project. Rebecca held workshops that included making herbal remedies from the wild plants and flowers growing in the Sue Godfrey Nature Park right next to Crossfields Estate. Although we unfortunately missed the workshops, we caught up with her over the weekend in the Nature Park, and her "bureau" is now on show in the Deptford Lounge till the end of this week (Sunday). 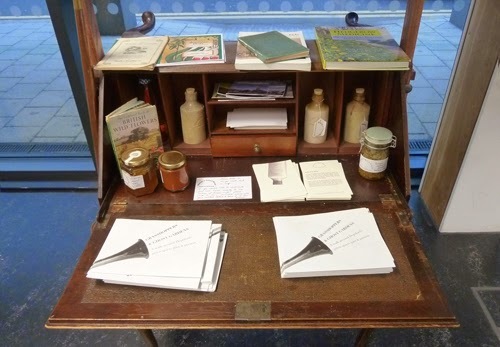 The bureau is the culmination of the work she did in the park and at Creekside Centre, and you can find pots of remedies made in the workshops, along with a map of a walk she led around Deptford's green spaces, and other informative bits and pieces. 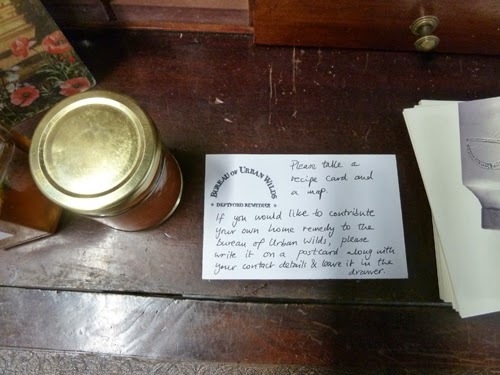 Rebecca will be producing a recipe book of remedies gathered from Deptford residents and is inviting people to contribute via the bureau. If you have some favourite recipes (perhaps passed down through your family) why not pass them on? 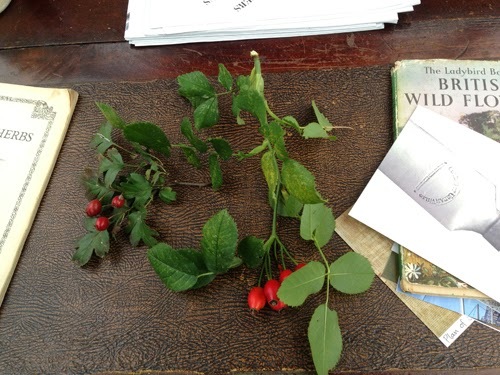 When we found her in the park on Sunday, we learned how to make a remedy from the Hawthorn berry (good for regulating the heart) and Rosehips (a great source of Vitamin C), both of which are growing in abundance in the park right now. We tasted a lovely relish made of hawthorn berries, a gorgeous tasting Rosehip syrup, and had a tot of elderberry vodka (good for warding off colds) from elderberries harvested in the park over summer. All you need is a little knowledge on how to recognise the edible (and free) seasonal ingredients that can be found in the nature park (it's berry time), plus some recipes and some patience, a mesh strainer, and honey, vinegar, water or alcohol to make either teas or delicious syrups and foodstuffs. Perfect for these austere times – and all on your doorstep. 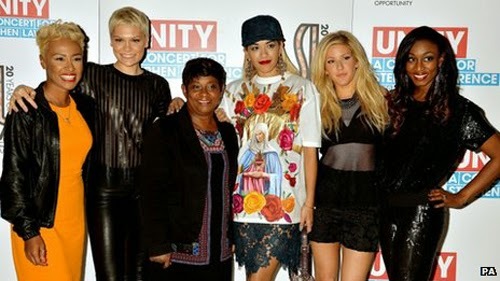 Lots of artists we've never heard of performed at the O2 on Sunday night in Unity: A Concert for Stephen Lawrence, proceeds of which will go to the Stephen Lawrence Trust. The concert also included artists we have heard of, whilst Danny Boyle introduced Doreen Lawrence on stage. Highlights from the show will be broadcast tonight on BBC One at 10.35pm and can be seen again on Thursday on BBC Three.